Only Cleveland fans could tell that the NFL Type Cover has the Browns' “new” logo. As the NFL is basically a money-printing machine, the cost to get your team logo isn’t cheap. A standard Type Cover can be found for as little as $101 on Amazon. A Type Cover with the nifty integrated fingerprint reader for Windows Hello is $135. The NFL Special Edition Type Cover will set you back $159. Ouch. That makes it as expensive as Microsoft’s fancy Signature Type Cover, and that’s made with a luxury material we can’t even pronounce called Alcantara. So yeah, you’re paying for some player’s Cadillac Escalade and for an owner’s private jet, but at least you’ve got team spirit. It’s sad that when being used, you won’t be able to troll fans of competing teams. But maybe that was done for the vast majority of teams that won’t make the playoffs this year. I do take issue with the design choice of the NFL Type Cover. Each team’s logo is placed on the back of the Type Cover and is offset, so it covers the fold. Maybe it’s me or my lack of design aesthetics, but I would prefer to see the entire logo on the back and centered. The logo itself is also only on the back the NFL Type Cover. When you’re using your Surface, the logo is hidden. That’s a big problem if you’re a Denver Broncos fan and you want to troll Panthers fans while you sit in a cafe in Charlotte, North Carolina. If you’re rolling a Surface Pro 4 and its included keyboard, the only thing you get out of this is a fresh keyboard and team pride. For superfans, that’s worth it. For others, it’s a steep price price to pay when you could just put a $3 sticker on your current Type Cover keyboard. The NFL Type Cover lacks a finger print reader option, too. The keys are tighter, the trackpad larger and overall, it’s a great upgrade—for Surface Pro 3 users. I think the NFL Type Cover will appeal far more to the Surface Pro 3 user. The Surface Pro 3 and Pro 4 share the same keyboard dimensions, so the cover's fully interchangeable. Having used the Surface Pro 3 for a year, I considered its keyboard to be the standard that other tablet keyboards should strive for. After using the NFL Type Cover, I realize the bar has been raised. With the NFL Type Cover's better key pitch, and tighter, less rattle-prone keys, I found myself making far few typos. The trackpad is larger and feels smoother, too—a big improvement. At this point, I don’t think I could ever go back to the Surface 3 Type Cover, even though a brand-new one is less than a third of the price of the NFL Type Cover. If you go this route, just remember there’s no pen loop with the NFL Type Cover because it’s made for the loop-equipped Surface Pro 4, so you’ll have to buy an optional pen loop for $5. The trackpad is larger, and smoother than the one on the Surface Pro 3’s. I do miss that pen loop though because the Surface Pro 3 lacks the magnetic pen. At $159, the NFL Special Edition Type Cover isn't cheap. To be fair, nothing that has a licensed NFL logo ever is. It's worth considering for Surface Pro 4 users who are NFL superfans, because only they would mind the cost versus the lack of additional functionality, let alone a fingerprint reader. For the Surface Pro 3 user though, it’s something to strongly consider. By now, after a year or three of use, your Surface Pro 3 keyboard is probably as janky as mine. 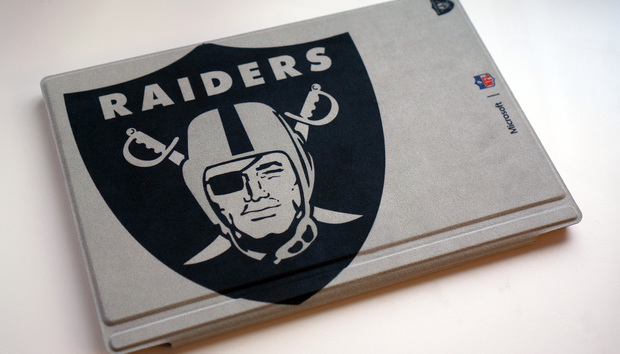 An upgrade to the NFL Type Cover breathes more life into the still-usable Surface Pro 3 and lets you represent at the same time.